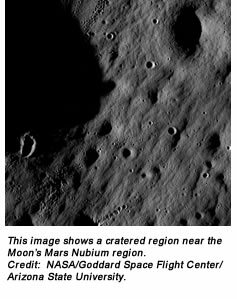 NASA’s Lunar Reconnaissance Orbiter (LRO) has transmitted its first images since reaching lunar orbit on June 23. The spacecraft has two cameras: a low-resolution Wide Angle Camera and a high-resolution Narrow Angle Camera. Collectively known as the Lunar Reconnaissance Orbiter Camera (LROC), they were activated on June 30. The cameras are working well and have returned images of a region a few kilometers east of Hell E crater in the lunar highlands south of Mare Nubium. As the Moon rotates beneath LRO, LROC will gradually build up photographic maps of the lunar surface. LRO will help NASA identify safe landing sites for future explorers, locate potential resources, describe the Moon’s radiation environment, and demonstrate new technologies. The satellite also has started to activate its six other instruments. The Lunar Exploration Neutron Detector will look for regions with enriched hydrogen that potentially could have water ice deposits. The Cosmic Ray Telescope for the Effects of Radiation is designed to measure the Moon’s radiation environment. Both were activated on June 19 and are functioning normally. Instruments expected to be activated during the next week and calibrated are the Lunar Orbiter Laser Altimeter, designed to build three-dimensional topographic maps of the Moon’s landscape; the Diviner Lunar Radiometer Experiment, which will make temperature maps of the lunar surface; and the Miniature Radio Frequency, or Mini-RF, an experimental radar and radio transmitter that will search for subsurface ice and create detailed images of permanently-shaded craters. The final instrument, the Lyman Alpha Mapping Project, will be activated after the other instruments have completed their calibrations, allowing more time for residual contaminants from the manufacture and launch of LRO to escape into the vacuum of space. This instrument is an ultraviolet-light imager that will use starlight to search for surface ice. It will take pictures of the permanently-shaded areas in deep craters at the lunar poles. After the spacecraft and instruments have completed their initial calibrations, the spacecraft will be directed into its primary mission orbit in August, a nearly-circular orbit about 31 miles above the lunar surface.